Demere Landing Homes: MAJOR PRICE IMPROVEMENT! FABULOUS One of a Kind Home on Double Waterfront Lot, Direct Access with NO Bridges to the Gulf of Mexico! Perfect for Sailboat or Powerboat!!! 54’ X 14’, No-Seeum Screened, caged Lanai, Built with Solid “IPE” Brazilian Hardwood, and 2 X 6 Construction, No Screws on Deck. Jacuzzi Hot Tub on Lanai. 34’ X 6.4’, “IPE” Dock with Fish Cleaning Station, water and electric. Lighted stairs to dock. Spacious, Light and Bright, Split Bedroom, Great Room, Open Floor Plan. Very Large Open Kitchen. 3 Spacious Bedrooms. Huge Master Suite. Huge Master Shower, 2.5 Bathrooms, Wood Burning Fire Place. Large Built-in Office Area. Granite Countertops In Kitchen, Office, and Master Bath. Stainless Steel Appliances. Plantation Shutters on all Windows and French Doors. 4 Skylights. Wood Burning Fireplace with brick Mantel. No Carpet. Loads of Storage. Very Clean. Very Well Maintained. No HOA or CDD Fees. City water, sewer. 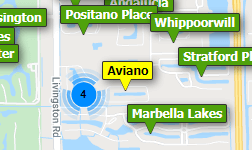 Located in the Fabulous Bayshore Revitalization Area of South Naples. Close to Celebration Park, Beaches, Restaurants, Shopping, Downtown, Botanical Gardens + MORE! Must See Inside! Seller Motivated! Demere Landing Homes: NO BRIDGES TO GULF! Three Story Key West style home with direct gulf access for the avid boater, just minutes to Naples Bay. This home has many desirable features including new flooring, granite counters, custom fans and fixtures, NEW paint, New Stainless Steel appliances in the kitchen, stainless steel undermount sink, dumbwaiter, a fireplace in the living room and one in the master bedroom, volume ceilings, plantation shutters, speaker system throughout, security system, and fire sprinklers throughout. There are many new developments taking place in this Bayshore District including a new microbrewery, food trucks with waterfront dining, and much more! Located close to downtown Naples shopping, nightlife, fine dining, fishing pier, beaches and nightlife, and a VERY short boat ride to Market 360 Waterfront Cafe! 926 square feet on the ground floor is finished with a family room or recreational area, gym and bathroom. PLEASE VIEW ATTACHED FLOORPLAN.